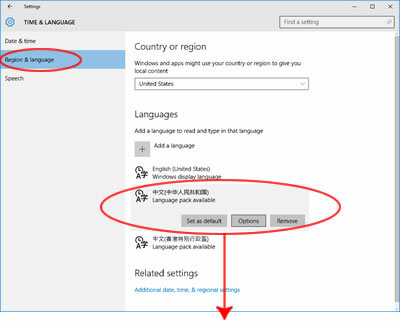 There are two choices for Hanyu Pinyin input of Traditional characters in Windows 10. Your choice should be based not only on your preference for (or annoyance with) one or the other, but also with attention to what encoding standard is being used by the people you communicate or exchange documents with most. The wrong choice will make it more likely you'll experience technical problems later, like e-mails turning into unreadable garbage. 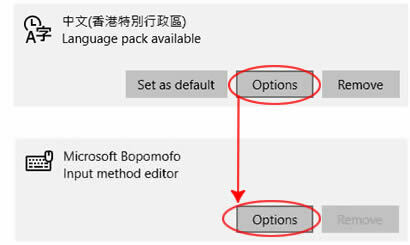 Microsoft Bopomofo also does Pinyin, but in the infinite wisdom of Microsoft the name was changed from New Phonetic to this (微軟注音 in Chinese) in Win 8. Let's call it "MSZY" now. This IME is available in the Hong Kong, Macau, and Taiwan language options described on the previous page. It offers modern Traditional characters including the Hong Kong set, and supports the Taiwan Big5 or International Unicode encoding standards. It offers the ability to enter Pinyin with or without tone numbers and phrase association, and includes tools like the IME Pad for lookup by radical and stroke count. Originally developed for Traditional characters only, it also offers a Simplified character option. Microsoft Pinyin, or MSPY (微軟拼音), is based on the SimpleFast version first introduced in 2010, and true to that name it is optimized for fast phrase-based input. This IME is the standard Pinyin input method in the mainland China and Singapore language options described on the previous page. It offers a Sogou-style typing experience that automatically inserts apostrophes between each sound. It offers very good phrase association but few other ways to narrow down your candidate list, and in the initial Windows 10 release is missing the IME Pad and other tools last seen in Windows 7. Originally developed for Simplified characters, it also supports a very literary Traditional character set that for example includes only 衹 and not the modern 只, all in the mainland GB Code encoding standard. 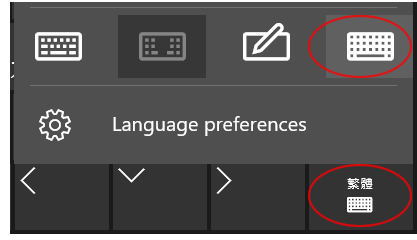 Assuming your language options are already set up to this point - as described on the previous page - go to the taskbar, open your language menu, and click "Language preferences" at the bottom. Now close Settings, and you're done! 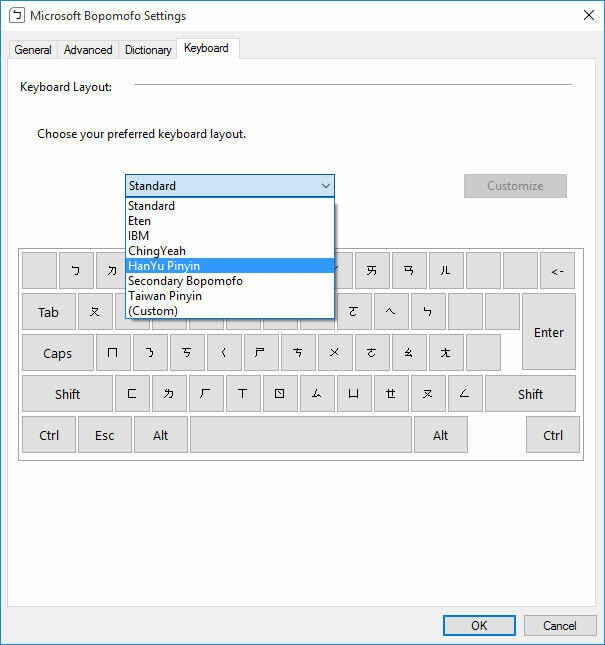 Select the option circled here for the full virtual keyboard with Latin and Zhuyin keys. 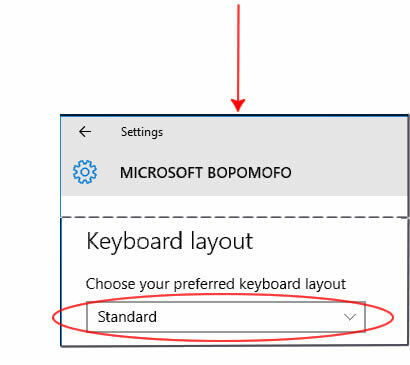 You may find this or another button greyed out, because Windows 10 tries to give you only options the developers think are best for your PC. If you cannot access the full Latin+Zhuyin keyboard, that is probably because you are on a desktop PC (or Windows 10 thinks you are). I have no hack to get around this, but you may find one out there on the web. In the above example, I am using a laptop without a touch screen. On this laptop, I can have the full Latin+Zhuyin keyboard, the handwriting keyboard (see the Windows 10 handwriting, speech, and language packs page for information on activating that one), or the smaller Zhuyin-only keyboard. It will not let me use the "split keys" keyboard, because that is only for devices with a touch screen. Again, I have no hack to get around this "convenient" feature, but it may be worth searching for one. Using the old-style desktop language bar? 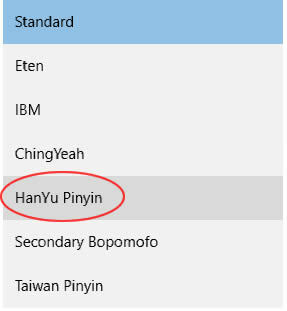 In Microsoft Bopomofo Settings, select the "Keyboard" tab and change the preferred keyboard layout to "Hanyu Pinyin". (I refuse to even type the camel case they use there...). Then click the "OK" button, and you're done! 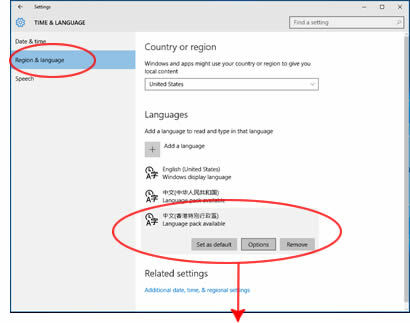 Use the Microsoft Pinyin (MSPY) IME to input Traditional Chinese characters if you must communicate with people in mainland China or others who have their systems set to the PRC national standard encoding called GB Code. Also go ahead and use it if you're not worried about these encoding issues at all. But using this IME can result in scrambled emails if you communicate with people who use Taiwan/HK/Macau settings. The Traditional characters available in MSPY since Windows 8.1 are a rather literary set that is missing some modern "simplified" characters in common use in Traditional character regions. For example, it has 衹 but not 只 (zhi3). When in Traditional character mode, the candidate list will not sort automatically based on frequency of usage. 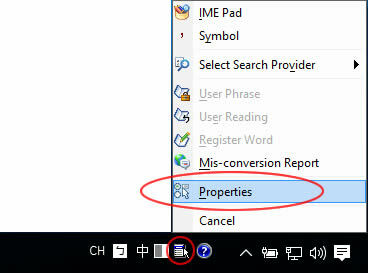 As of the launch of Windows 10, the IME Pad for radical and stroke lookup is missing from this IME. See also my list of missing, broken, and just plain lame features in Windows 10, where I'm tracking problems, updates, and workarounds. We can only hope these missing features will reappear in a free update...eventually. Having said that, many people do use the MSPY IME to type Traditional characters, and if you are good at working in cizu and phrases it will be very fast. Here's how to set it up. 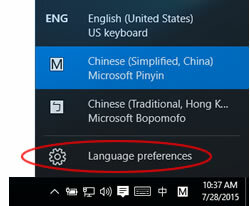 Open the Language menu, and at the bottom select "Language preferences", as circled in the image here. 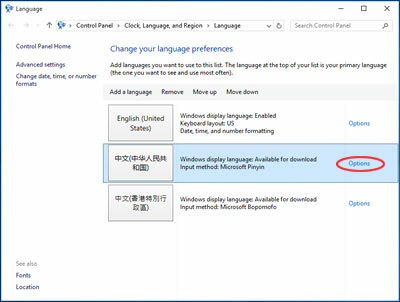 You can also get here by typing "Language" into the taskbar Search Windows box, or by navigating in from Start > Settings. 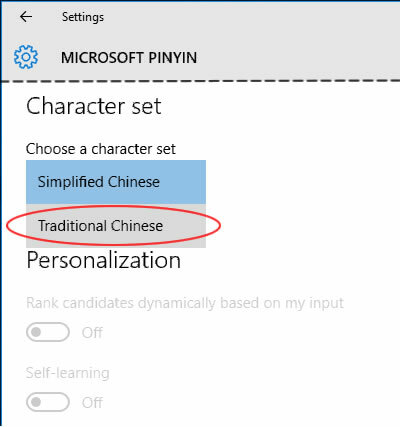 Now in the settings panel for Microsoft Pinyin, change the characters set menu to Traditional Chinese. If you're planning to use the on-screen Touch Keyboard, click this link to jump up the page to my notes about making it show more than just Zhuyin keys. 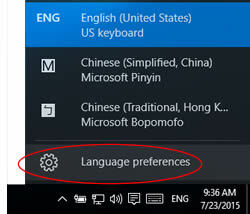 Right-click on the "CH" button or the "M" (for Microsoft Pinyin) button. On the the menu that pops up, select "Settings...". 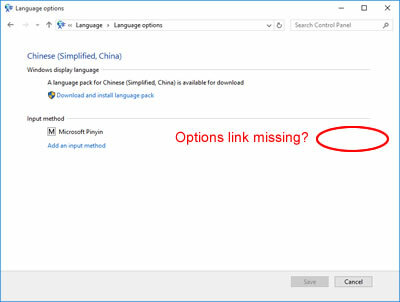 Then if you're lucky, in the Language options control panel, you'll find an "Options" link for Microsoft Pinyin, which will open a control panel where you can make this change. But in all my initial installations of Windows 10, this link was missing! I'm hoping that link will be there for you, or will appear after the next big IME update, so I went ahead and posted this info. But if not, you'll have to go back up to the previous instructions for the new Settings panels.